Are you thinking of planning for a down payment but don’t know where to begin? Whether you’re just a year away from buying a home or still several years out, there’s no better time than now to start implementing new strategies for saving money. Although it may seem a little daunting, it doesn’t have to be that way! Home buying should be a fun process, not a stressful one, so take these tips into consideration that will take a little weight off your shoulders and reassure yourself that you’ll be financially ready once the time comes to close on your new home. If you’re a year or a few years away from buying a home, you’re not too early to the “saving” game. If anything, you’re a bit late. But don’t worry! If you start budgeting and watching your money closely, you’ll feel more secure about buying a home in no time! Ideally, you’ll want to start planning around five years ahead of time, but if not, you’ll have to work with what you can get. Don’t start researching prices of homes in your area just yet. Start by thinking of strategies you can use to save money. Make a list and make it long! You can always find new ways to save money, so keep the list on your fridge and add to it as you come up with new ideas. In order to save money, you don’t have to focus on big changes like selling off your car for a mophead or moving into the trashiest apartment in your city. Start with small changes that will show tremendous savings in the long run. Spending too much money on coffee? Try making your own coffee, or getting a small instead of a large. This may seem like insignificant, but it could save you thousands each year that could be put into a down payment on a new home. Once you’ve established an early plan for saving money, you should start figuring how much money you’ll be able to save if you implement these changes in your life. This will be a long process, but it’s worth it, trust me! Chances are, the amount of money you’ll be able to save up will surprise you and will motivate you to stay on top of these new life changes. If you lose sight of some of your goals, you’ll still be a lot more conscious of the money you are saving and make you more aware of your finances in general. Most people already have some form of savings account to hold money and grow interest. However, you should create an account that sets aside a certain amount of your paycheck, out of sight and out of mind so that you aren’t tempted to take from it. Not only will you be surprised at how much money you’ve accumulated, but you’ll be more money conscious due to less money appearing in your regular account each week or two. Like anything you want to accomplish in life, you’ll need to stay persistent and keep your goals in mind at all times. You can do this by setting reminders or rewarding yourself if you meet your monthly financial goals. It’s all about keeping your original goal in sight and making it a habit to avoid wasteful spending. If for whatever reason, you choose not to purchase a home like you originally intended, you’ll have a lot of money built up for retirement or whatever you choose. 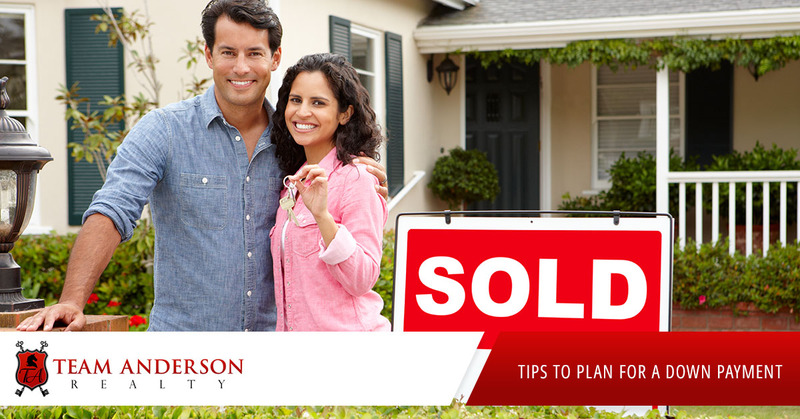 If the time comes that you begin looking at homes and start planning to buy one, don’t hesitate to contact your professional and experienced real estate agents at Team Anderson Realty in Holly Springs, North Carolina and the surrounding area. Since becoming a licensed realtor in 2009, Erica Anderson and her team have helped countless people find the home they’ve been looking for at a great price. We understand how difficult it can be to save up for the home of your dreams, so we want you to get it once the time comes. Contact us today to learn more about our real estate services.